All three of my children absolutely love DUPLO. 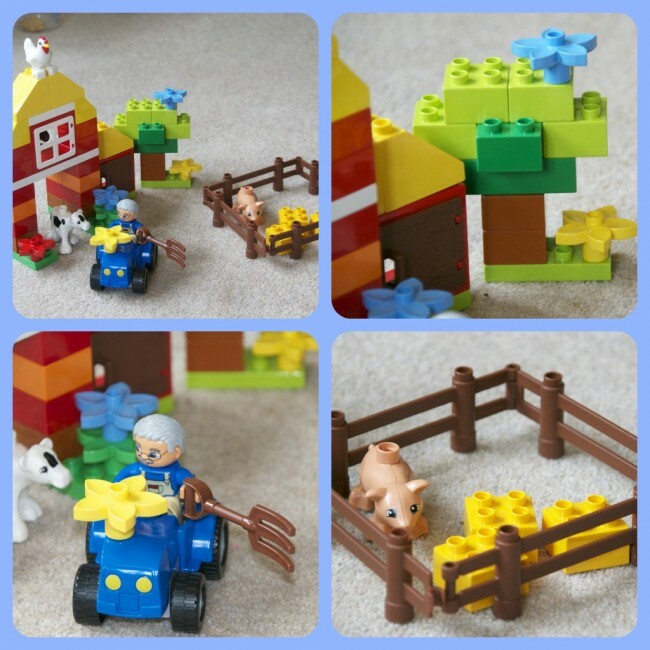 DUPLO is the one toy that is played with every day. Z builds fancy looking space ships and complicated patterns. S builds houses for her little people, and H likes to build tall towers. The My First Farm set is a lovely addition to our collection. H loves animals so was very excited to find a pig, sheep, hen and calf as well as a farmer she calls ‘Grandad’. As with all DUPLO, the set is brilliant quality and I know will last for years to come. The booklet comes with some lovely ideas for learning through play. Counting the bricks and animals. Sorting the bricks by colour. Building structures and selling which is tallest. H and I have made all the animal noises together, tried to learn colours ( everything is red ) and counted a LOT! You can see our review of the Creative Cakes and DUPLO Sorter here. Don’t forget DUPLO is compatible with normal LEGO too, so it can still be used for older children, and have you seen the new Cinderella Castle set? We think it looks amazing. Thank you very much to DUPLO for sending us this set to review. She’s so cute! This looks fantastic, I’m wondering if we need to try Duplo with The Boy or go straight onto Lego?